Drinking saved Robert ‘Rob’ Reed’s life. Reed, a lieutenant colonel in the U.S. Army who served several tours in Iraq and Afghanistan, was serious as he explained how his inebriation botched his suicide attempt. He was so drunk that fateful night in 2008, he didn’t realize he’d looped the rope with which he intended to hang himself around a rotten tree limb, he said. He jumped. The rope snapped. He was still alive, on the ground of his then-home in Virginia. 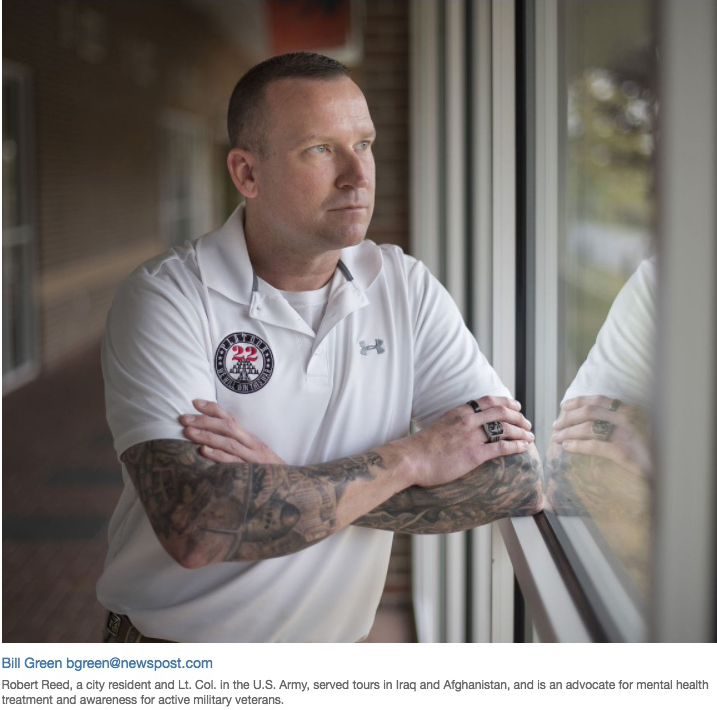 Reed, 41, who lives in Frederick, had no qualms in a Tuesday interview talking about his attempted suicide, or the depression, anger and alcohol abuse that led him there. “It was hell,” he said, recalling the frequent combat, death of both Afghan and American members in the small, embedded training team he led. Returning home in 2008, he began drinking heavily. He slept in a trench he dug in his front yard, just like he had while in Afghanistan. When his then-wife left for a business trip, he tried to hang himself. Tattoos cover both his forearms, reminders of those lowest of lows and the messages of hope that helped him along his journey to recovery. He lifted the sleeve of his Platoon 22 shirt to reveal more inked designs. A flag with a Biblical line his training team read before embarking on missions covers his right shoulder, his deployment dates below it. On his left shoulder sits an eagle, accompanied by the dog tags of his dad, a Korean War veteran. A heaven and hell battle scene plays out below it, and a lit candle beside a Bible.